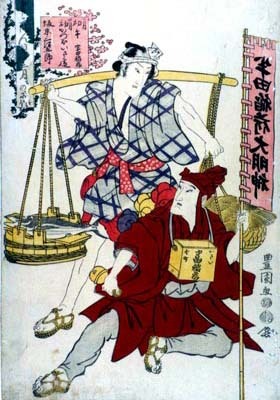 The actor Bandô Mitsugorô III performed in the 3rd lunar month of 1813 at the Nakamuraza a 12-role hengemono, which was entitled "Shiki no Nagame Yosete Mitsudaiji". One of these 12 roles, a bonito seller, survived and became the dance "Katsuo Uri". The original version was Tomimoto-based. it is now staged with a Tokiwazu ensemble. An edokko fish monger out selling the first bonito (katsuo in Japanese) of the year. An edokko is a person born and raised in Edo, whose family has been in Edo for at least three generations. He is characterized by his lively spirit and compassion for others. This dance shows a high-spirited form of the fish monger as he goes out into town carrying the container for fish across his back.